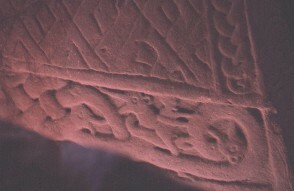 Hogback, side view, dated to the first half of the tenth century. This is the hogback known as the saint's tomb. The top of this side has a three-strand plain plait decoration. There is a panel of plait around this. Below this the wall panel shows a four-strand plain plait. This ends in three animal heads at the edge. They have long jaws and round eyes. Between the heads of the two beasts to the left there is a human figure, shown in profile, sitting astride, and enmeshed in the creature. The human's foot goes below the line of the panel's lower frame. Bailey, R.N., Cramp, R.J., Corpus of Anglo-Saxon Stone Sculpture. Vol. 2, Cumberland, Westmorland and Lancashire North-of-the-Sands 1st, Oxford University Press, Oxford (1988) Stones, Sculpture, Anglo-Saxons, England..